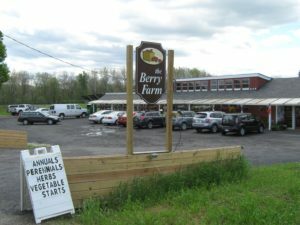 Although the winter of 2015-2016 lacked snow in the Hudson Valley of upstate New York, it was a long winter and spring has been slow in coming. 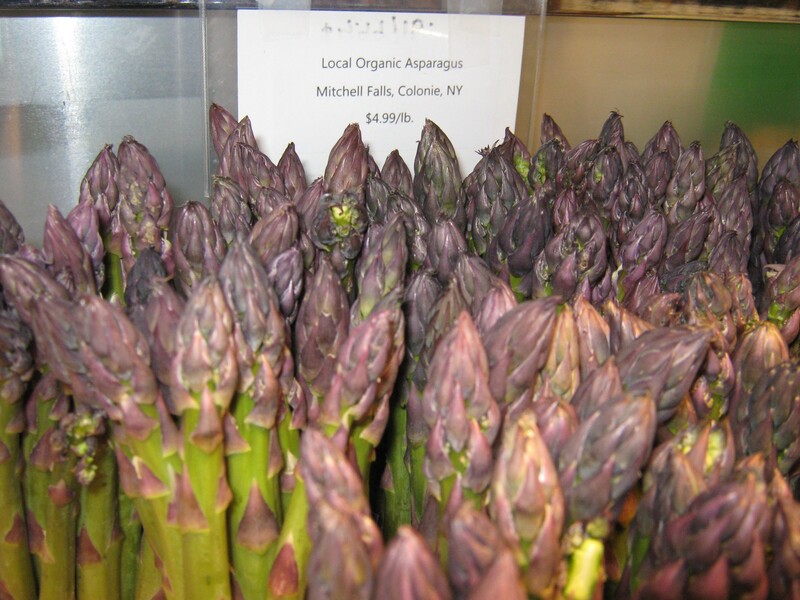 Now with spring here and Albany’s 2016 Tulip Queen anointed, it’s time to be on the lookout for (local and organic) rhubarb and asparagus, in particular, but recent trips to the Troy Waterfront farmers market in nearby Rensselaer County and to my local food co-op, the Honest Weight in Albany, have not resulted in finding (yet) a nearby source for local and organic rhubarb or asparagus. The co-op did have for sale conventional asparagus from New Jersey and organic rhubarb from Oregon, but I’m still waiting for the local and organic bounty. But there was some success in finding local and organic asparagus 30 miles south of Albany at the Chatham Berry Farm, a farm and farm store which specializes in “natural, organic and local produce and products as well as no spray, pesticide-free greens and vegetable from its greenhouses throughout the year.” To my surprise, the farm store in rural Columbia County had organic asparagus grown by grower Mitchel Falls in Colonie, an Albany suburb. At $4.99 per pound, I began to ponder why more local farmers and gardeners (this writer included) don’t maintain a bed or two of the perennial. 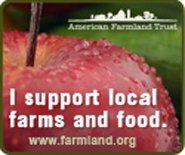 As the Old Farmer’s Almanac says, “It may take 2 to 3 years to get started and produce, so patience is needed!” But then the grower will have a delicious vegetable that has always been prized. And in addition to its culinary attributes, asparagus has been valued for its medicinal value for hundreds of years. According to Edible, An illustrated guide to the World’s Food Plants (Washington, D.C., National Geographic Society, 2008, www.nationalgeographic.com/books), asparagus was “a favorite of the Romans, who cultivated spears much larger than modern cultivars.” Edible notes also that in Italian folklore, asparagus was even touted as an effective form of birth control. Hmm, the distinctive odor in one’s urine from eating asparagus perhaps spawned this theory? 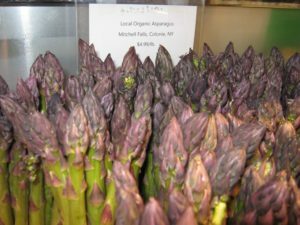 Edible also points out that the botanical name for asparagus, officinalis, means “from the dispensary” and that it is “a diuretic and a laxative.” In addition, it has been thought over the ages to help with eye problems, toothache, cramps, and sciatica. Who knows? But what cooks do know, asparagus is delicious. The handy, stand-by cookbook, Joy of Cooking by Irma S. Rombauer, Marion Rombauer Becker, and Ethan Becker (New York, NY: Scribner, 1997), provides some helpful tips in selecting and cooking asparagus. The thinner the shoot, the younger and according to Joy of Cooking, “usually the tenderer.” Further, the shoots can be green, purple, or green and purple. And this tip is much appreciated: Select crisp, tightly closed stalks whose cut ends are not dry. 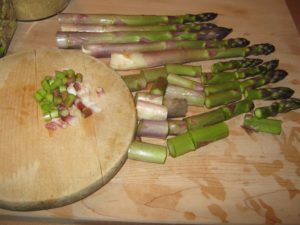 Asparagus is perishable, so plan to serve it the day of harvesting or purchase, In the meantime, submerge the ends of the spears in a pitcher of water and refrigerate. We also love Tracey Medeiros’s The Vermont Farm Table Cookbook, 150 Home-Grown Recipes from the Green Mountain State (The Countryman Press, Woodstock, VT, Distributed by W.W.Norton & Co., New York, NY, 2013), and pleased to share with our website users this easy and delicious recipe for Asparagus and Brown Rice, a favorite of Jane Pomykala, co-owner of Pomykala Farm in Grand Isle, Vermont, north of Burlington on Lake Champlain, who likes to make this hearty meal in the spring, when asparagus first appears on the scene. This simple dish is bright with citrus notes from the lemon zest and juice, as well as a subtle nuttiness from the brown rice and Parmesan cheese. Place the rice in a fine-mesh strainer and rinse thoroughly. Place the rice and broth in a medium saucepan and bring to a simmer over medium heat. Cover tightly, reduce the heat to low and cook until tender and most of the liquid has been absorbed, about 40 to 45 minutes. Melt the butter in a medium skillet over medium heat. Add the asparagus and scallions and sauté, stirring occasionally until tender, about 6 to 8 minutes. Transfer to a medium bowl and add the rice. Stir in the cheese and lemon zest and juice. Season with salt and pepper to taste, sprinkle with thyme, and serve. Using some of my favorite local ingredients, as well as green garlic just harvested from my backyard garden and organic whole wheat couscous and raw, unsalted pistachio meats from the Honest Weight Food Co-op’s amazing bulk foods department, with its hundreds of bins of bulk foods, I decided to concoct a variation on the above Asparagus and Brown Rice recipe. Couscous cooks up in minutes and when there’s not enough time to cook rice or another grain, I like to use organic whole wheat couscous. 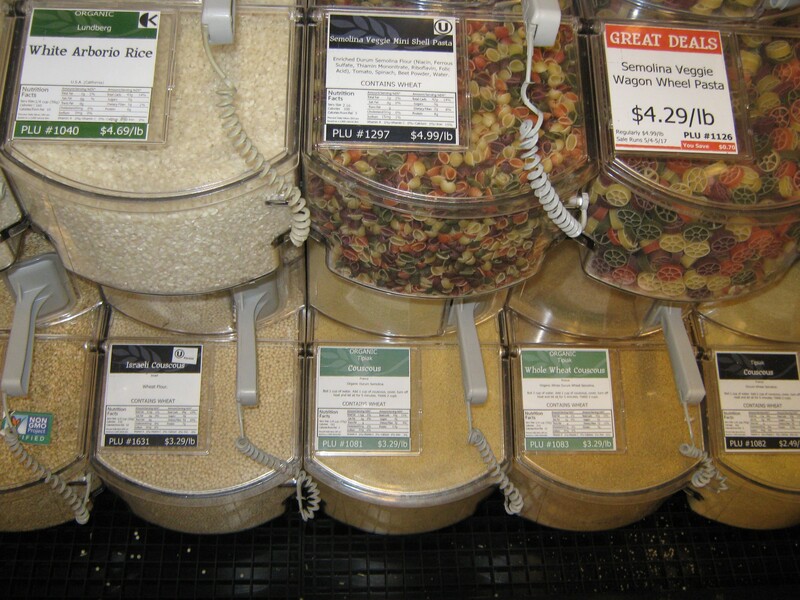 Made from coarsely ground, precooked semolina wheat, couscous is properly described as a pasta, not a grain. Also, I’ve substituted green garlic harvested from my backyard garden for the scallions in the recipe above. And my discovery of the special flavor of pistachios prompted the addition of raw unsalted & organic pistachio meats, also available at the co-op’s bulk food section. Although priced at $28.49/pound, only a handful are needed to add texture and additional flavor. Bring one cup of water and 1 tablespoon of olive oil to a rolling boil in a small sauce pan. Add 1/2 cup of whole wheat couscous. Stir once. Cover tightly and immediately turn off heat. Heat up the 2 tablespoons of olive oil in a medium skillet over medium heat. 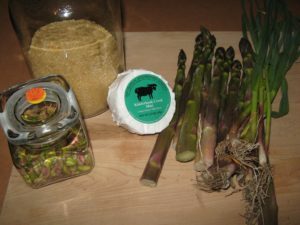 Add the chopped green garlic and asparagus pieces and chopped green garlic, lowering heat slightly, and sauté while stirring for about 4 minutes, add the handful of raw pistachio meats and continue stirring for an additional 2 to 3 minutes until the asparagus is tender. 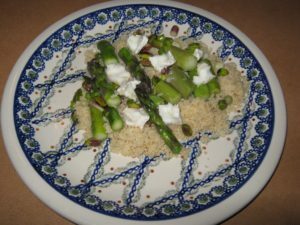 Serve the sautéed asparagus, green garlic and pistachios on the couscous, topping the dish with the cubed (if a soft cheese like the sheep cheese used in my preparation) or grated cheese. Additional asparagus recipes: For more challenging recipes using spring asparagus, New York Times City Kitchen columnist, David Tanis, offered three appealing ones in The Incomparable Stalks of Spring, a recent column in the paper.